This year’s run of King salmon on the Stikine River is projected to be small but still large enough for limited commercial fishing near Petersburg. The Stikine is a transboundary river that runs from near Wrangell into Canada so the two countries share the king salmon harvest. Most of the kings are spawning at the Taltan River just over a hundred miles from the Stikine’s mouth. Managers on both sides of the border want there to be enough kings to spawn for future years and, if possible, allow for subsistence, commercial and sport fishing. Like king salmon in many other parts of Alaska, the Stikine run has diminished over the past decade. The low point was in 2009 when the Stikine saw only 16,000 kings. But numbers have improved slightly in recent years, and in 2012, there were enough kings for a limited commercial opening. And that’s the same thing this year. The projected run for this year is 33,900 fish. Canada is allowed to harvest 4,700; the U.S. 1,100. The state has called an opening for commercial troll fishing and drift gill netting in nearby District 8 on May 2. Troll fishing will open at about midnight and gill netting at 8 a.m. They will be 24 hour openings. 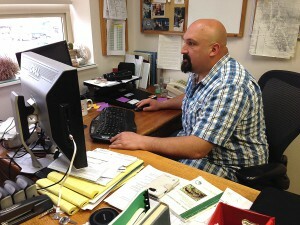 Troy Thynes is the Area Management Biologist for the Alaska Department of Fish and Game. Historically, about 30 boats start the season in the drift gill net fishery and more participate as it progresses. In the peak years, like in 2006, there were upwards of 110 boats. That year saw the largest run on record at 90,000 kings, so the commercial openings were more generous. Records have been kept on the Stikine River since the late 70s. This year, fishing will be limited to only areas past the flats at mouth of the river. The king estimate could change as the run actually happens. “Generally the peak of the Stikine River king salmon run is through the marine waters through salt waters off the flats is the last week of May, first week of June,” said Thynes. If the in-season numbers are similar to the preseason ones, then Alaska’s allowable harvest will jump up from 1,100 to 3,600 fish. Managers get in-season data through a joint tagging project with Canada, which is a mark and recapture program. The tagging will start in May, and Thynes said it takes fishermen participation to help make it work. Sport fishermen will also have more opportunity this year. Thynes said sport fishing will be liberalized starting May 1. Also harvested in District 8 will be king salmon from hatcheries at Anita Bay and Crystal Lake. They typically run a little later in May.